Acknowledging that it is just a TV show, and recognizing that I do have a life, I must still comment on my great disappointment with “Lois & Clark: The New Adventures of Superman.” Last night’s episode started out wonderfully, with HG Wells showing up at the Daily Planet and enlisting the aid of Lois and Clark to battle an evil time traveler. The scenes in the past — and the clever use of Jonathan and Martha Kent in several roles as Clarks ancestors added to the charm of the episode. And the very intriguing plot — trying to the kill the infant Superman — was brilliant. Clark’s interaction with his parents was charming, and the chemistry between the series leads was better than e ever. Lois handles learning Clark’s secret as we expected she would: Anger at first, humiliation at not having put things together herself, followed by a growing acceptance of Clark/Superman. By the end of the show, the pair have shared a wonderful adventure, and Lois even got the opportunity to save Superman’s life. As they kissed, you could feel the bond between them deepening — this could be the start of something wonderful. Alas, it was all a cheat. 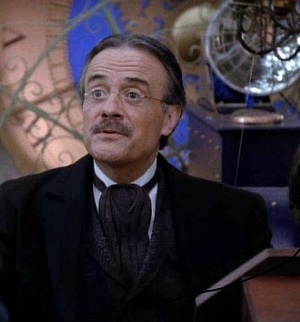 As soon as Lois made the comment about feeling strange knowing Clark was Superman, and HG Wells said, “Oh, no, not yet,” I could see the cheat coming a mile away. 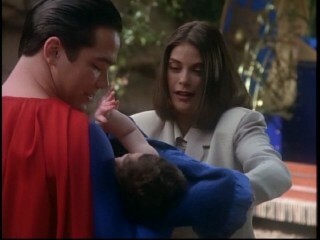 Lois was not going to remember Clark’s secret when the pair returned to 1995–and that destroyed this episode, and the credibility of the series. Way back in the old 1950s George Reeves Superman series, we never expected anyone to find out that Clark was Superman. Anyone who ever did ended up falling off a cliff or blowing up before they could reveal the secret, or got a whiff of Professor Pepperwinkle memory-erase spray. But in the theatrical release, “Superman II,” Margot Kidder’s Lois Lane found out that Clark was Superman — and it lead to many very touching and beautiful scenes between Christopher Reeves Superman and Lois. When the movie ended and Lois forgot the entire episode with Superman’s “Amnesia kiss,” many people called it as a cheat — and in my opinion, the movie series never really recovered. The current Superman comic book features Clark and Lois engaged to be married. Lois knows Clark is Superman, and this works very well. The comic did not suffer because of Lois knowing — it got better. I remember one terrific scene in which Lois and Clark leave a dinner party to check on a crisis. “Corridor is empty,” Lois says as Clark switches into Superman. “Be careful,” she says. “I always am, honey,” he says and he flies away. The comic, for the first time, is treating these characters adults, and the end result is believable. Well, as believable as a guy who flies can get, anyway. In any case, the Lois & Clark show has been very good, featuring many more good episodes than bad. The chemistry between Hatcher and Cain is undeniable, and this obvious plot device to make the characters forget this amazing adventure is unforgivable. “Lois & Clark,” unless it continues to evolve, will grow stale very fast. look what happened to the TV show “Moonlighting” years ago. By the time David and Maddie made love, nobody cared anymore. I am not suggesting that Clark and Lois jump into bed, but she should know that her partner is Superman. Sunday nights episode — until the conclusion — demonstrated that Lois and Clark work very well together, especially when she knew the secret. If anything, it brought them closer. The producers of the show should take heed: They have blown a great opportunity here, and should takes steps to fix things, fast.